Dr. Forster has been providing telepsychiatry to his patients for 10 years. Telepsychiatry works well for people looking for a single-visit consultation, and for people looking for a second opinion. Dr. Forster also consults with primary physicians and other mental healthcare providers. 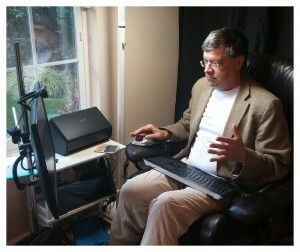 Dr. Forster offers telepsychiatry appointments on Saturday mornings. He occasionally has telepsychiatry openings during the week if he has had a late-cancellation. This type of session is not for everyone. For example, if you are looking for a prescription, it is against federal law to prescribe controlled substances (like anti-anxiety medications like lorazepam or stimulants) solely based on a telepsychiatry assessment. Dr. Forster is a board-certified San Francisco psychiatrist who uses the latest treatment research on depression, bipolar, post-traumatic stress disorder and mood disorders in his practice. Dr. Forster is a Clinical Professor of Psychiatry at the University of California, San Francisco, where he has taught hundreds of medical students, psychiatrists and nurse practitioners about the treatment of people with depression, bipolar and other mood disorders. “I believe that too many people who are wrestling with depression, or bipolar, or other mood disorders, find themselves confused by what they need to do in order to feel well, or they get stuck with less than adequate treatment, or they feel ashamed, or embarrassed about the very real problems they are dealing with.